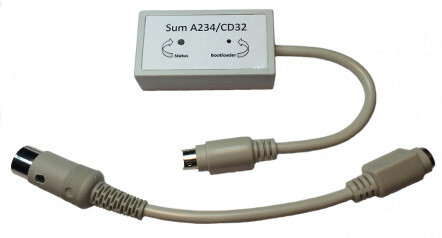 The Sum A234/CD32 adapter enables you to connect USB HID keyboards to your Amiga 2000/3000/4000 or CD32. The Sum interface is based upon a 16-bit Microchip microcontroller. 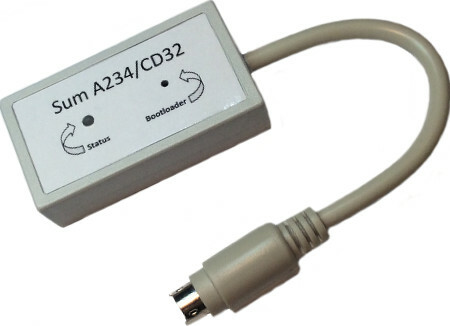 The Sum adapter provides a built-in USB stack which enables USB HID keyboards support without the need for installing additional AmigaOS software drivers. The whole installation process comes down to simply connecting a keyboard to your Sum adapter and the Sum adapter to the keyboard port of your Amiga A2000/A3000/A4000 or CD32. An additional feature of the Sum adapter is its "Bootloader" function allowing future firmware upgrades. The Sum interface comes with a dedicated configuration mode which becomes available when one presses R-Shift + Pause keys simultaneously. User preferences are saved to the built-in EEPROM memory, thanks to which the interface is already properly configured when you reconnect the device.